At Ahn’s Tae Kwon Do (Ahn’s TKD) you will eventually come across the term “Moo Duk Kwan.” It may be on a black belt, on a flag, on a certificate, or a patch on an instructor’s uniform. So what is Moo Duk Kwan? What does it have to do with Tae Kwon Do? By the 1950s Moo Duk Kwan, teaching Tang Soo Do, had emerged as the largest and most influential of the five major kwans (see list of kwans below). As the martial arts community grew in Korea it also began to emerge as a source of national pride. The government became keenly interested in Korean martial arts. At that time the sheer volume of school names, style names, and governing organization names was simply overwhelming and confusing. Inevitably, a power struggle ensued involving not only the martial arts schools/organizations but also the South Korean government. A unification and standardization effort, driven mostly by the government, commenced which resulted in several mergers and name changes. In 1965 the Tae Soo Do Association changed its name to Tae Kwon Do. For various reasons, Tang Soo Do / Moo Duk Kwan never merged into the mainstream unification movement that ultimately gave rise to Tae Kwon Do. 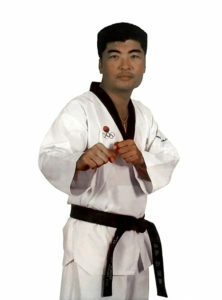 However, beyond a doubt, if you look toward the “heart and soul” of Tae Kwon Do you will find Tang Soo Do / Moo Duk Kwan. Today Tae Kwon Do is internationally controlled by Kukkiwon (aka World Tae Kwon Do Headquarters) located in Seoul, Korea. Kukkiwon, also known as “The World Taekwondo Headquarters,” is the official governing organization, sanctioned by the South Korean government, to oversee all things related to Tae Kwon Do. It establishes/maintains standards, grants/registers black belts, and defines the sport of Tae Kwon Do, for the International Olympic Committee, so that fair, standardized Tae Kwon Do competition can be a part of the Olympic Games. Click here to learn more about Kukkiwon.